About 85 workers at Multimatic turn out one Ford GT a day. Best known for building performance cars such as the Ford GT, Multimatic Inc. is reorganizing into three units to underpin a growing, broader business. The Markham, Ont., automotive engineering and manufacturing specialist has undertaken a multi-layer expansion into three operating groups: Multimatic Mechanisms, Multimatic Structures and Suspension, and Multimatic Engineering. Engineering for the company's own manufacturing divisions has become its primary focus, with facilities strategically launched to accommodate growth in North America, Europe and Asia, according to CEO Peter Czapka. Key initiatives include light-weighting with carbon fibre, suspension damping and enabling autonomous vehicles by integrating data from sensors with mechanical features. The company now sits at more than 500 global employees, some who have been there since Day One. Its expansion can be attributed to the combination of production-focused engineering, advanced research and development capabilities, a focus on innovation and the offering of high-volume production, all found under one corporate roof. But as many automakers push for lightweight parts, Multimatic’s expertise and production capacity of carbon fibre composites and suspension dampers give it the opportunity to become a single-source solution. That is changing the company’s culture. The Multimatic assembly team works on the Ford GT in Markham, Ont. Czapka, now the sole owner of the privately held Multimatic corporation, recalls the early days of producing door hinges for Ford, Chrysler and General Motors, as well as door checks for Honda in its 50,000-squarefoot (4,600-square-metre) plant in 1984. At that time, the company was a division of Magna International, eventually becoming a 50/50 joint venture between Czapka and Magna until Czapka’s full acquisition in 1991. Multimatic has played its part in assisting the development and engineering of IndyCar and Formula One race cars, as well as several Aston Martin projects such as the DB10, Vulcan and Lagonda Taraf. But nothing has upped its public image and portfolio more than the production of low-volume super vehicles. It started with the Aston Martin One-77, but no other car pushed the company outside its comfort zone more than the road and race versions of the 2018 Ford GT. 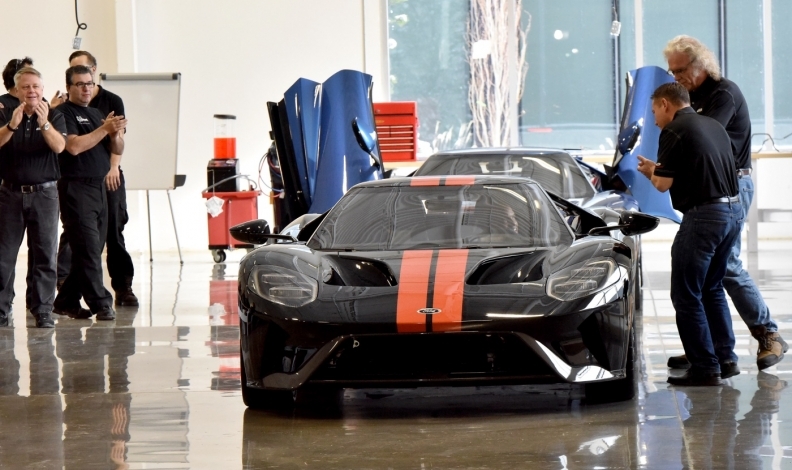 To achieve the annual goal set out by Ford, the GT received its own dedicated factory, a 60,000-square-foot (5,600-square-metre) space called Mutlimatic Niche Vehicle Assembly North America, in its home-roots of Markham, Ont. Each day, just one nearly US $450,000 supercar is built by 85 workers and a total of 6,000 total parts. To be in charge of production for Ford’s most sacred and secretive project was “a proud moment” for Czapka. “Multimatic is currently leveraging its recognized expertise and capabilities to develop and supply differentiated products in three growth areas addressing convenience, safety and performance,” said Czapka. They are mechatronic products, carbon-fibre structural products and Dynamic Suspensions Spool Valve (DSSV) damping technology. Mechatronics, a combination of mechanical, electronic, computer and software engineering will integrate electronic sensing and controls with mechanical functions. As for carbon-fibre structures and DSSV technology, Multimatic will begin to use advanced systems including its proprietary high-speed production process called SPP (Selective Pre-Preg) for its carbon-fibre products, as well as make advancements in its DSSV technology for race and road applications.